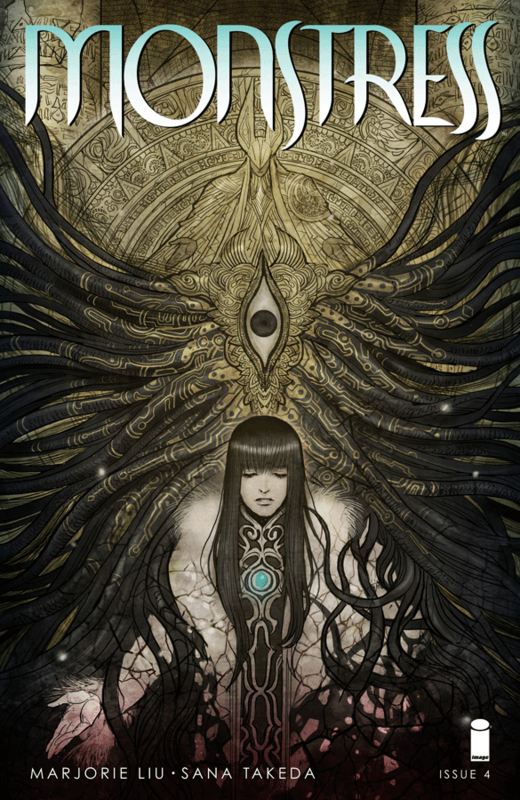 'Monstress' continues to world build with dense mythology and riveting characters. Marjorie Liu and Sana Takeda have been parsing this beautiful dark fantasy in consumable bites that are often immersive and engrossing. As it continues to evolve so does its vying for best series of the year. The political climate continues to boil as we get to see the Arcanics point of view and the fear of impending war being stirred by the Cumaea.There's no consensus within the Arcanics hierarchy but a clear division between the Ancients and everyone else. An informative, and adorable, history lesson at the end of the issue details the origin of the Arcanics. The most exhilarating aspect of the issue is the sentient monster or Monstrum that resides within Maika. It's self-aware and awfully "chatty" with Maika but also hungers for blood. The dialogue between them is revealing and demonstrates the enormity of the inner conflict of harboring this powerful force. Something that isn't loss on poor little terrified Kippa. Liu has a fully formed universe to unmask to readers, one so dense and sprawling she can only reveal a little at a time. Each issue is part of a larger puzzle as it tries to explain the motivations behind the different factions and keep up with Maika's story. Questions remain but 'Monstress' is able to satisfy and stimulate the reader at the same time. This is the kind of comic you settle in for and take your time. You have to pay close attention and savor it. Takeda's art especially is so intricate and rich even in the smallest of panels, to glance over it would be a travesty. She paints an ornate world full of elaborate beauty that is undercut by the cruelty of its inhabitants. It's the dichotomy of 'Monstress' where you won't find a book illustrated anymore lovely but fraught with danger and melancholy. 'Monstress' is one for the ages. As epic as it aims to be with stunning visuals and evocative storytelling. This is one series that should be bought in print and held in one's hands to truly appreciate it. Liu and Takeda have poured their souls into 'Montress' the least you can do is add it to your pull list.